BOB GARFIELD: From WNYC in New York, this is NPR's On the Media. Brooke Gladstone is away this week. I'm Bob Garfield. Two months ago, The New York Times Company, owners of The Boston Globe, gave The Globe unions an ultimatum: submit to 20 million dollars in payroll cuts or face shutting down. 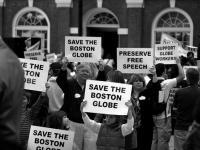 Since then, some Globe employees have agreed to concessions, but this week the Newspaper Guild, representing the paper’s editorial employees, voted no, whereupon The Times Company, led by its chairman Arthur Sulzberger, Jr., unilaterally imposed a 23 percent wage cut and started the process of shopping The Globe to prospective new owners. What’s playing out in Boston is a familiar drama, one that in the coming months and years will get familiar-er, the sad spectacle of the slow death by bleeding of a venerable institution. The Globe’s crisis is, on one hand, remarkable. The paper has been a New England institution and an indispensable element of the democratic process for 137 years. On the other hand, it is but the latest victim of industry-wide pandemic. Adam Reilly has been covering the death throes for The Boston Phoenix, and he joins me. Adam, welcome. ADAM REILLY: Hey, thanks for having me on. BOB GARFIELD: We're speaking on Thursday. What’s the latest? ADAM REILLY: Well, the latest is the Boston Newspaper Guild rejected the Times Company’s contract proposal earlier this week. The Times Company has said that they are going to declare an impasse and unilaterally impose a 23 percent pay cut starting next week. The Guild responded, or some members of the Guild responded, by pleading with Arthur Sulzberger, Junior to act like the mensch they know he is and keep the pay cut from happening, and Sulzberger basically told them to get lost, that there was nothing he could do. We're told that a real estate company here in Boston may be looking at buying the paper, and also – I think I neglected to mention – that the Guild is attempting to get an injunction preventing the pay cut from being implemented. So there’s still a lot of motion. BOB GARFIELD: So just tell me how bad the cash flow situation is there. How much money is the Times Company losing on The Boston Globe year to year? ADAM REILLY: Well, the Times Company refuses to publicly say what The Globe’s losses are, specifically. That said, it’s become conventional wisdom, perhaps more than it should be, that The Globe lost 50 million dollars last year and is on pace to lose 85 million this year. BOB GARFIELD: While the particulars vary, it seems to me that we're just playing out a drama that we have seen before in Minneapolis, in Philadelphia, in Seattle, where the outcome has not been good. Despite The Times’ claims that at the moment they're not going to shut down The Boston Globe, what’s your sense for what “at the moment” means? ADAM REILLY: I actually traded emails with Catherine Mathis, the Times Company’s spokeswoman, about this, after she made her statement that The Globe, in fact, is not going to close, and I asked her, you know, if the Guild gets an injunction that keeps the pay cut from going through, or if they don't get an injunction but mount what turns out to be a successful unfair labor practices charge with the National Labor Relations Board, then would The Globe be shut down? And Mathis, you know, for understandable reasons, didn't want to entertain those scenarios. So I think if either of those things happen, then the paper quite conceivably could be shut down. The Times Company clearly wants to rid itself of the paper. I mean, they paid 1.1 billion for it in 1993. Estimates of The Globe’s worth now vary wildly but, you know, no one thinks it’s worth more than 20 percent, I would say, of that original purchase price. BOB GARFIELD: Let me ask you one last thing, Adam. This story is obviously big news on On the Media, and it’s big news at The Boston Phoenix and certainly in the newsroom of The Boston Globe, but what does the readership have to say about all this? ADAM REILLY: Well, when the closure threat was first made, the reporters - a couple of reporters from The Globe were given the unenviable task of going out and sort of taking the pulse of how people felt about this situation. And I don't think they did a scientific sampling, but some people said, you know, oh, I can't imagine starting my day without the paper, it’s, you know, part of what New England is. And some people said, well, I won't really miss it if it goes. The Guild has attempted to drum up public support for its stand as it takes on the Times Company. I went to a rally, a ‘Save The Globe’ rally that was held at Faneuil Hall in Boston, and I've got to say the atmosphere there struck me as pretty lukewarm. Not a ton of people turned out. There were a lot of confused tourists. There were some street vendors making balloon animals. There were a few hundred people there; a lot of them were connected with the paper. Those of us who work in the media, myself included – I mean, this is what I do for a living – but I think sometimes perhaps we -slightly exaggerate our own importance when we run into challenging situations. If The Globe disappears, it'll be a real loss locally. I mean, The Globe drives the news agenda in Boston and Massachusetts far more than any other outlet. But, other outlets will step in. They might not fully fill the vacuum, but life will go on. BOB GARFIELD: Did you get the poodle or the dachshund? ADAM REILLY: [LAUGHS] I got the funny hat. BOB GARFIELD: Adam, thanks so much. ADAM REILLY: Thank you, Bob. BOB GARFIELD: Adam Reilly is a reporter for The Boston Phoenix. Here’s one of the problems with death. You don't get to hear the eulogies to find out how important you were to everyone, after all. [MUSIC UP AND UNDER] In that spirit, On the Media announces the Eulogy Project so you can share with us how, for better or worse, newspapers have fit into your life. 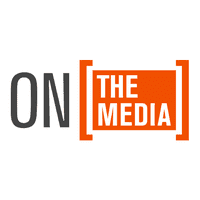 If you have an anecdote, a memory, even a horror story about what your local paper has meant to you, email us at Onthemedia@wnyc.org or leave a comment at Onthemedia.org. Please share it, before it’s too late.